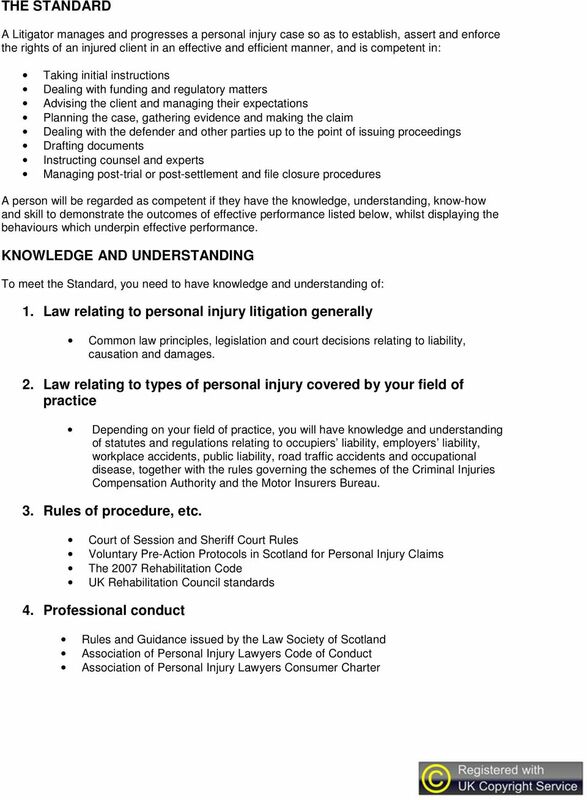 Download "ASSOCIATION OF PERSONAL INJURY LAWYERS SCOTLAND Standard of competence for Litigators"
1 ASSOCIATION OF PERSONAL INJURY LAWYERS SCOTLAND Standard of competence for Litigators INTRODUCTION Standards of occupational competence Standards of occupational competence are widely used in many fields of employment. They are based on an analysis of the main functions of a job, and state what it is the job holder must be able to do to perform effectively. That analysis enables an identification of the knowledge, understanding, know-how, skill and behaviour required for effective performance. A Standard is thus, primarily, a business tool. 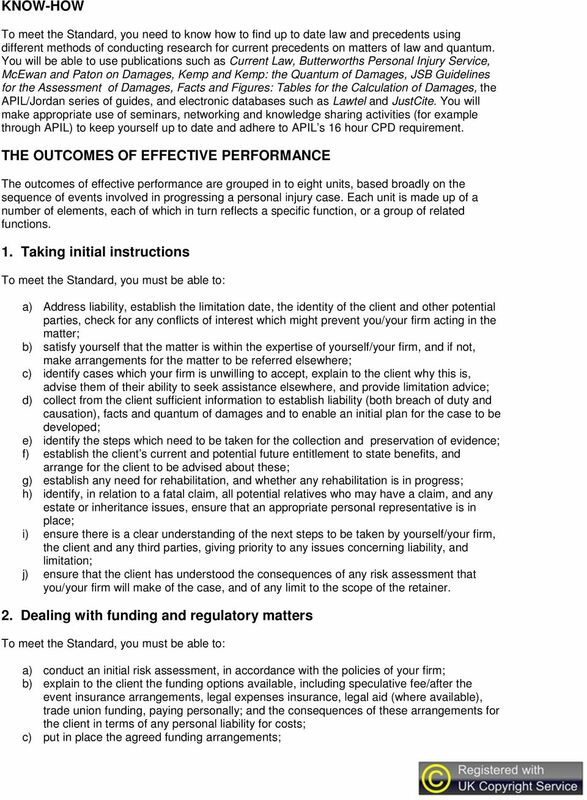 It enables a firm to specify what is required for the effective performance of a job. 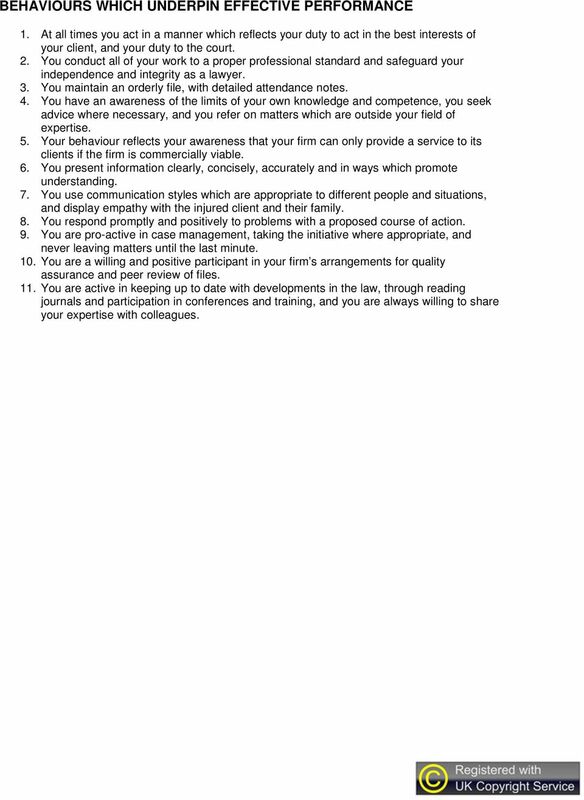 That specification can then be used as an aid to recruitment or promotion, but it is probably of greatest use in drafting a development plan for an individual who aspires to the role concerned, in appraising the performance of those who hold the role, and in identifying training needs which may exist. Standards of occupational competence are used also as a means of setting the intended learning outcomes from training programmes, or for qualifications. They provide a benchmark against which personal accreditation of competence may be judged. The Litigator Pursuer personal injury lawyers act for the victims of accidents, disease and injury, and seek to establish, assert and enforce their rights, in an effective and efficient manner, through negotiation, mediation or litigation. The range of cases, in terms of complexity and legal challenge, is very wide, ranging from minor road accidents to catastrophic multiple injuries, progressive industrial diseases and clinical negligence cases. Whilst financial remedies are important, rehabilitation of the injured person to restore them to as productive and independent a lifestyle as possible, through the use of medical, functional and vocational intervention, is also vital. Litigator is a personal accreditation status awarded by the Association of Personal Injury Lawyers to its members. It sits in a hierarchy of personal accreditation, and for some lawyers will represent a step on the way to securing Senior Litigator status. A Litigator will usually work under supervision. A Litigator will usually have their own files, carriage of which is their responsibility. A Litigator may work on relatively straightforward Sheriff Court cases, with fairly light supervision, they may progress Court of Session or more valuable Sheriff Court cases, under closer supervision, or they may assist a more senior lawyer with aspects of a complex case. 2 Whilst many of a Litigator s cases will be settled by negotiation with the other side, a Litigator is more than a negotiator. He or she is a lawyer dealing with a case in a legal framework where there are rules, duties and obligations to be observed. A Litigator may take a case to the point of negotiated settlement, or to the point at which it is appropriate to issue proceedings. Beyond the point of issue of proceedings, the case may pass to a Senior Litigator, or may be subject to fairly close guidance from a Senior Litigator. As, at the outset of a case, it cannot be known if it will be necessary to issue proceedings, all of the work of a Litigator must be to a standard appropriate to a matter which could result in a court hearing. A Litigator will be focused on achieving the best possible result for their client. A Litigator may handle more than one type of personal injury case, but may well deal only with an individual field, such as road traffic accidents or employer s liability. There is no requirement to have served any specified period of time to secure Litigator status. Realistically, from first involvement with civil litigation, it is likely to take at least two years experience to develop fully the competence required for the status. The Standard is thus of particular value in preparing a personal development plan for an individual who aspires to Litigator status, in that it enables types of experience and training which will develop the required competence to be identified. The scope of the Standard The Standard assumes knowledge of civil litigation law and procedure sufficient to progress Sheriff Court cases. 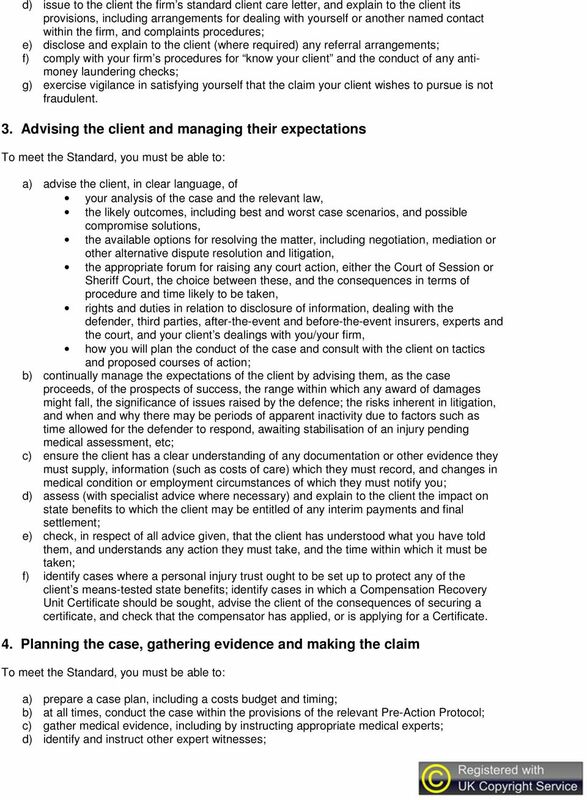 The Standard addresses the circumstances of a person working as a Litigator in an office of a firm of solicitors. 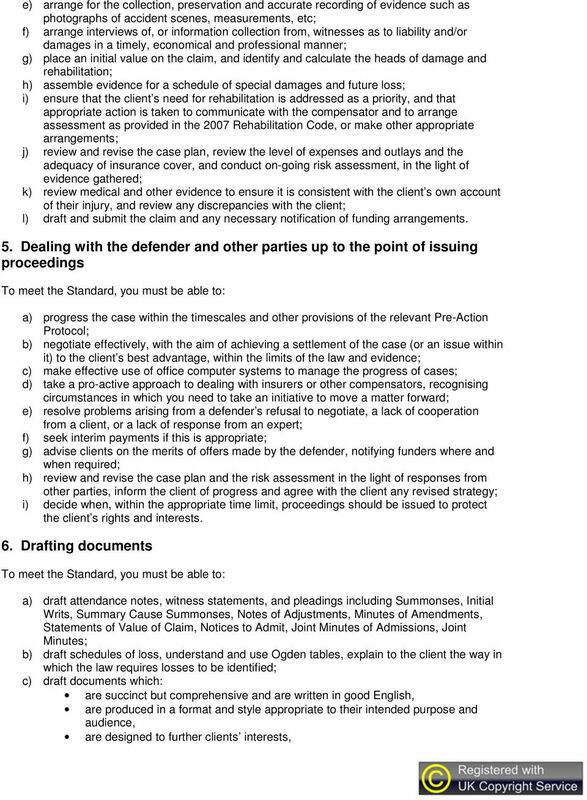 The Standard reflects the law, regulations, Voluntary Pre-action Protocol, Court of Session and Sheriff Court Ordinary and Summary Cause Rules. A firm of solicitors is subject to all of the standards of professional conduct published by the Law Society of Scotland, and may be covered also by the standards of the APIL Corporate Accreditation Scheme. Nothing in the Standard is inconsistent with any of these other standards or requirements. 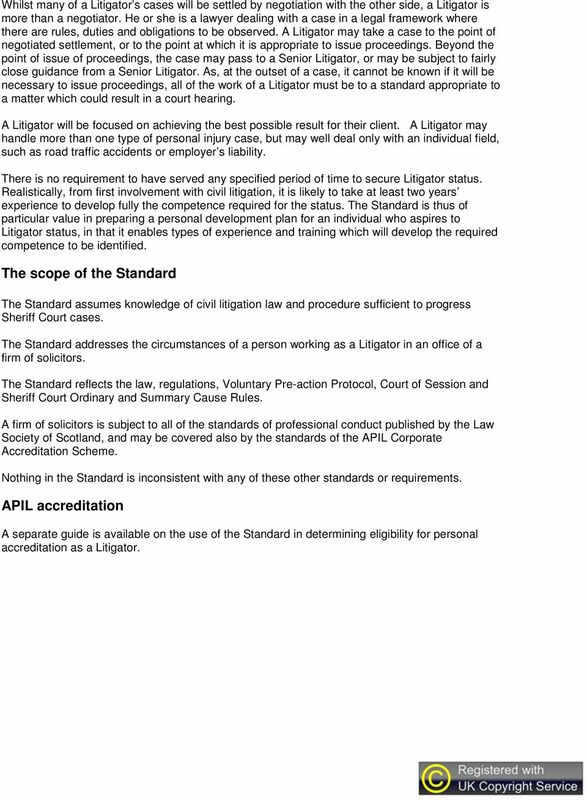 APIL accreditation A separate guide is available on the use of the Standard in determining eligibility for personal accreditation as a Litigator. 7 fulfil legal requirements, are accurate in law and make critical use of precedents, if formal court documents, conform to court rules, are produced in an efficient and timely manner. 7. Instructing counsel and experts a) identify the point(s) in a case at which it is appropriate to involve counsel through seeking informal advice, a formal opinion, or holding a consultation with counsel; b) make a selection of counsel appropriate to the issues in the case, using your firm s register of counsel; c) agree with counsel the basis of their remuneration; d) make a selection of experts in relation to the evidence to be proved, using your firm s register of experts; e) agree the amount and timing of payment to experts instructed; f) explain the role of counsel and experts to your client, and in particular the duty of the expert to the court; agree with your client whether they should attend a consultation with counsel; g) ensure that letters of instruction to experts set out clearly the nature of the opinion that is sought using, where appropriate, the model letter to medical experts annexed to the Pre- Action Protocol for Personal Injury Cases; h) ensure that instructions to counsel state clearly the objective being pursued by the client, and summarise key issues in the case; i) ensure that all and only relevant supporting documentation is sent to counsel and experts; j) agree timetables for the provision of opinions or advice, and take effective steps to ensure these are adhered to; k) Check expert reports and documents prepared by counsel to ensure that all issues identified in the instructions have been addressed. 8. 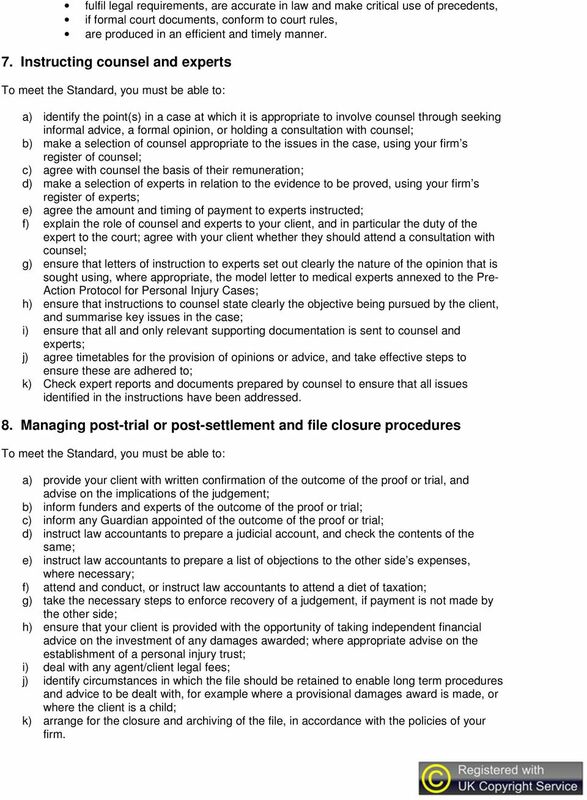 Managing post-trial or post-settlement and file closure procedures a) provide your client with written confirmation of the outcome of the proof or trial, and advise on the implications of the judgement; b) inform funders and experts of the outcome of the proof or trial; c) inform any Guardian appointed of the outcome of the proof or trial; d) instruct law accountants to prepare a judicial account, and check the contents of the same; e) instruct law accountants to prepare a list of objections to the other side s expenses, where necessary; f) attend and conduct, or instruct law accountants to attend a diet of taxation; g) take the necessary steps to enforce recovery of a judgement, if payment is not made by the other side; h) ensure that your client is provided with the opportunity of taking independent financial advice on the investment of any damages awarded; where appropriate advise on the establishment of a personal injury trust; i) deal with any agent/client legal fees; j) identify circumstances in which the file should be retained to enable long term procedures and advice to be dealt with, for example where a provisional damages award is made, or where the client is a child; k) arrange for the closure and archiving of the file, in accordance with the policies of your firm. 8 BEHAVIOURS WHICH UNDERPIN EFFECTIVE PERFORMANCE 1. At all times you act in a manner which reflects your duty to act in the best interests of your client, and your duty to the court. 2. You conduct all of your work to a proper professional standard and safeguard your independence and integrity as a lawyer. 3. You maintain an orderly file, with detailed attendance notes. 4. You have an awareness of the limits of your own knowledge and competence, you seek advice where necessary, and you refer on matters which are outside your field of expertise. 5. Your behaviour reflects your awareness that your firm can only provide a service to its clients if the firm is commercially viable. 6. You present information clearly, concisely, accurately and in ways which promote understanding. 7. You use communication styles which are appropriate to different people and situations, and display empathy with the injured client and their family. 8. You respond promptly and positively to problems with a proposed course of action. 9. You are pro-active in case management, taking the initiative where appropriate, and never leaving matters until the last minute. 10. You are a willing and positive participant in your firm s arrangements for quality assurance and peer review of files. 11. You are active in keeping up to date with developments in the law, through reading journals and participation in conferences and training, and you are always willing to share your expertise with colleagues. 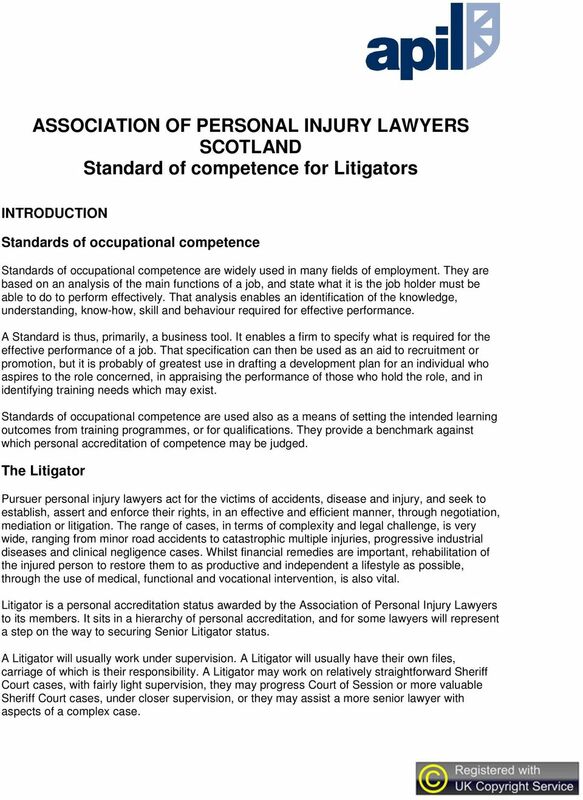 ASSOCIATION OF PERSONAL INJURY LAWYERS Standard of competence for Fellows INTRODUCTION Standards of occupational competence Standards of occupational competence are widely used in many fields of employment. Civil Litigation: Reparation Law Legal Domain The paralegal should be able to competently commence cases in different courts from initial instruction to completion on behalf of both Pursuer and Defenders. IOSH Midland North District 26 th February 2015 The Civil Case Housekeeping Fire Safety please follow signs exit via stairwell and front door. Assembly point on car park. Toilets located on each landing. To manage, on behalf of the Trust, all clinical negligence claims and employer/public liability and miscellaneous risk pooling claims.